In 2047 a method was developed that allowed the humans to travel to planets in nearby solar systems and even build colonies there. In 2050, the first colonists left the Earth to populate four planets of the "G-type": Alpha Centauri, Tau Ceti (III), Van Maanen and Beta Hydri. Seven months later they reached the inhospitable, desert-like planet Tau Ceti and instantly started to build up a new civilisation. In the first 90 years the colony flourished, more than 30 cities could be built up and active trading with robot technology and ressources that were mined from underground caves formed the economic backbone of the society in Tau Ceti. In 2150 Tau Ceti and one other of the four colonies were afflicted by a catastrophe: A deadly plague, the Encke-Syndrome, broke out and left only a few survivors behind. The people abondoned the planet and left it to the automatic control systems and robots. Two years passed until a medication was developed on Earth. The contact to the two colonies that had been untroubled - Alpha Centauri and Beta Hydri - was re-established, but exactly at that point of time a meteor crashed into Tau Ceti and the radio contact with the control system broke off. 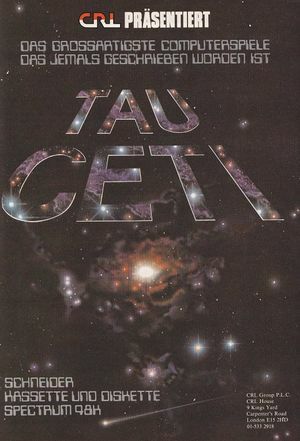 Nevertheless, the decision was made to repopulate Tau Ceti and already in 2164 the first Tau Ceti expedition took place. A single space glider landed safely on the planet's surface and could just send an emergency call to the Earth before radio silence set in. Experts were convinced that the robots had gone amok after the impact of the meteor. 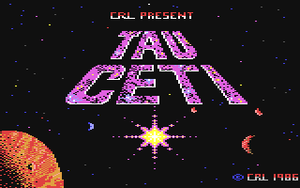 Tau Ceti is a graphically very well done game (especially the infrared view with the blur effect is interesting) that can do without any music. The sounds are limited to the most necessary. To decide for a genre description of this game is not very easy, the game consists of skill, strategy, flying, science fiction and action adventure elements and puzzle sequences. 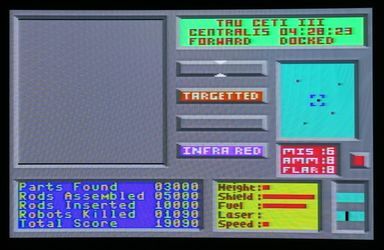 At the start, the game seems very difficult but as soon as you master the well-done controls of the glider and the board computer it is great fun to switch off the misdirected defence system of the planet Tau Ceti and to search for the cooling element parts and the main reactor. After the start of the game with the Space key you see a scroller at the bottom of the screen which contains information about the background story. The rest of the screen is taken in by the console of the spaceship which is currently in a basis. the radar screen (7) that shows buildings, hostile robots and mines (can be switched between close and distant scanning with the key "S"). The red field below that (11) shows the supply of missiles, anti-missile missiles and flares. If the glider is in flying mode, it can be controlled by joystick or keyboard; in the ground mode, the board computer can be controlled via input into the console. You get into the ground mode by docking the spaceship at a basis or by landing (speed to zero, height to zero, press "L" key). While having landed, you will not be attacked as the sensors of the defence system only react to levitating or moving objects. LAUNCH : The glider leaves the base and gets into open air or starts from the ground and the flying mode is activated. MAP : The computer shows a zoomable map of Tau Ceti that contains information about the towns. The cursor can be moved with the joystick, the fire button chooses the functions. LOOK : Switches to the inside view of a building. WAIT : Waits 1/12 of the planet's turn, corresponds to five Earth minutes. STATUS : Damage and progress report (also during flying mode). EQUIP : Enables you to repair and refuel the ship and restock the weapons (not everything is in stock everywhere) within a base. PAD : A small text editor, which serves as memo. NEW PAD : Opens a new page in the editor. QUIT : Ends the game. RODS : During your flights you collect parts of cooling rods (they are in the reactors), that can be put together with this command. REACTOR : Enables access to the main reactor in Centralis. KEYS : Shows the key assignments and allows a new assignment of all keys. At the start of the game you should enter NAME (Return) and tell the board computer your name. The rest of the commands, see "the board computer". To get to the planet's surface you should at first type LAUNCH. Now you see the scarce landscape in daylight, if you have not waited for too long. A day on Tau Ceti is very short and approx. corresponds to one hour on Earth. On Tau Ceti the day is divided into 16 "Spins". After sunset the planet's surface is clad in complete darkness, the infrared view (key "I") should therefore be activated immediately. Each of the altogether 32 cities has a great number of buildings as radar towers, turrets, civil buildings, etc. You can fly with the glider into the following: reactor stations, militäry and civil bases, the Gal-Corp-Lander and then main reactor in Centralis. In the reactor stations the single parts of the cooling system that needs to be assembled are stored. When you have found all 40 parts, they need to be put together to 20 cooling bars like a puzzle. (Shades of Impossible Mission.. each two parts make one bar seen from the top, so a circular area, by turning, reflecting and recolouring). The assembled cooling system should then be inserted into the reactor in the town Centralis, not an easy task, because this reactor is of course the best guarded building of the whole planet. Most of the towns are guarded by three types of well-armoured chaser robots, additionally heavily armoured mobile defence systems are around. Luckily, mines are shown by the radar scanner. Another hint: Tau Ceti is planned to be recolonised after the end of the mission, so the desctruction of civil buildings should be avoided. This is called up in the ground mode, so in buildings and after landing (height zero, then key "L") by entering "Map" and it is operated with joystick and fire button. IN, OUT : By clicking these icons the map can be zoomed in and out almost stagelessly. INFO : After clicking this icon, entering the name of the city and finishing the input with a press on the Return key, information about the expected defence force and the number, location and target town of the jump-pads in this city are shown. EXIT : After selecting this icon you will find yourself back in the board computer mode. Tau Ceti has a system of teleports (jump-pads), that allow simple travelling between the cities. The single teleports were built after an out-dated, not programmable "Super Traveller" standard, therefore you can only reach one single town from each teleport. The board computer, however, contains a database of the whole network, you just need to find the right teleport. These devices, which can be recognized by the squared planes on the ground with dedicated tower, are always at the northern, southern, eastern or western border of the city. To activate them, you need to press the key "J" and keep it pressed until you fly over the jump-pad (no matter in what direction). Near the teleport you need to beware, as the "sand jumpers" like to hang around there, a life form domestic on Tau Ceti. Save rather once too often than too seldom. Don't forget: This can be done at any time, even if you are not in a building. Simply land and then save. After loading a saved game and the following "LAUNCH" you are at the exactly same place as before. You find the centre of a town by keeping the needle of the small compass at the top (that always points into the direction of a city) always in the middle until it swings around quickly. To find your way to the desired jump-pad easiest you fly to the middle of the town, then turn until the display of the big compass is exactly on the desired direction (N, E, S, W). Now fly straight ahead until you reach the jump-pad. This is not always recommended because you most of the time have to fly through the whole defence system during this action. Therefore you should remember or note down the location of the buildings. In each town there is exactly one reactor. In each reactor there can be 0-2 parts of the cooling system. (Except for the main reactor in Centralis, here are three parts of the cooling system). If you shoot at a building that has a docking station, it will disappear and you cannot fly into this building any more. After a teleport into another town and back, the docking station is intact again. A building with a docking station cannot be destroyed. Contact with such a building leads to immediate desctruction of the glider. The assembled cooling rods can immediately be set into the central reactor of Centralis. This has the advantage that the reactor's power is reduced - depending on the number of cooling bars - and also the defence systems get ineffecitve by this percentage. After inserting all the cooling rods, clicking the Exit icon and watching the following end sequence you must press the Space key to see the reached score. Press the space key again to start a new game. The magazine Commodore User wrote in one of their issues in a game help that the game was unsolvable because the last rod parts would not fit together. This is definitely wrong, the game can be solved (as can be seen in this article), it can happen that you must visit a reactor twice to find missing parts (very mean...). After having found out the controls of the glider and the operation of the map and the jump-pads you will most definitely start a journey to Centralis, where you can experience the explosion of the glider after 10 seconds. So you start another try into a different direction, where you can get to know the peculiarities of the buildings and robots. After searching some reactors the aim of the game gets clear: You need to find all 40 parts of the cooling system, put them together (this is by the way a funny puzzle part in the game) and bring them to Centralis to insert them into the main reactor. 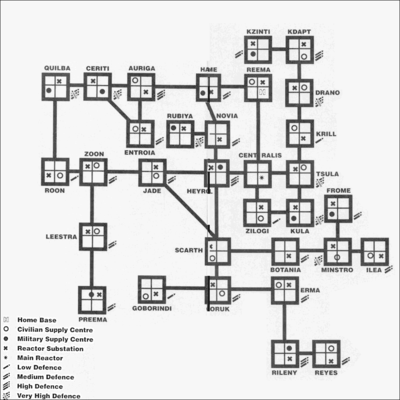 If you now draw a map of the connections and the buildup of the single cities and then find out, that the defence gets less when you insert some cooling rods into the main reactor, then the difficulty grade of the game loses its terror and eventually Tau Ceti will be ready to be populated again. About the graphics: This is very atmospheric by the change of day and night and the infrared view with blur effect are nice to look at. Furthermore it is relatively fast filled out. Concerning the sound: This is not exceptional but fitting the game well. As a summary you can say, that the game well deserves the points that the magazine Zzap!64 has given in the test. For me one of the best 3D games that I have ever solved." Robotron2084: "GREATEST GAME EVER WRITTEN is humbly emblazoned on the game's cover. Well, maybe to be more honest they should have written beneath "BY CRL", because this company has otherwise only attracted attention by their astonishing number of junk games. With one exception: TAU CETI! An inventive and above all technically impressive mixture of tactical 3D shooting in the style of Battlezone or Encounter spiced up with various puzzle and strategy elements. 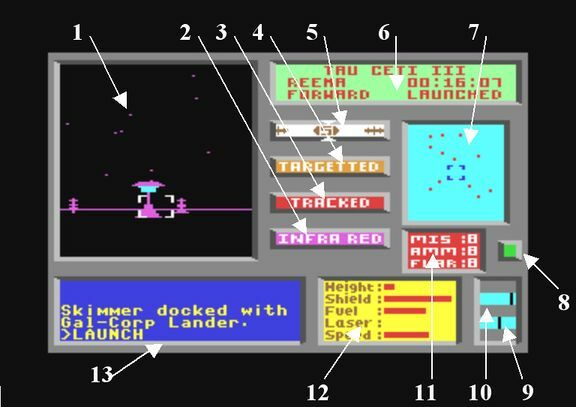 The attack on the defence systems bristling with weapons requires advance planning and sometimes a lot of patience, or otherwise your cockpit will be smashed mercilessly to pieces. The day and night phases are done very atmospherically, especially the sneaking up with infrared is well done. The difficulty grade is pleasingly high - when you trudge into the hangar with the last shield and fuel resources after a fierce gunfight, one can let out a deep breath of relief. 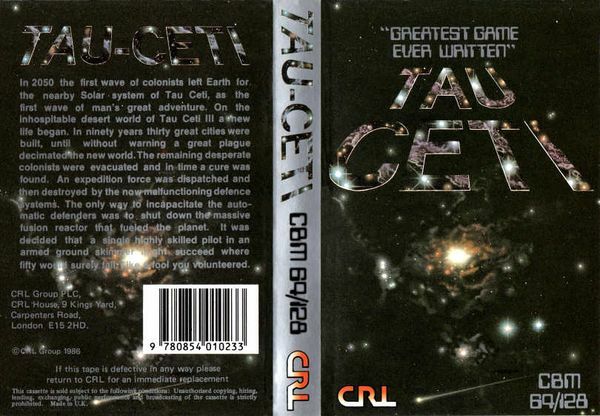 What I did not like that much is, that TAU CETI is rather a boring matter, which offers only little motivation to try it again once you have managed the game. Here, some smaller, randomly generated maps as e.g. in Impossible Mission and a time bonus could have raised the motivation to improve oneself. But the game is also good how it is and worth a recommendation. Side note: try and enter some X-rated things into the terminal and see what happens... hilarous! 8 out of 10 points." This page was last modified on 27 April 2016, at 18:16.